The second phase to clear the site of an ex-tannery for redevelopment has started. 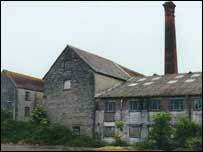 The old Morlands sheepskin factory in Glastonbury, Somerset, lay empty for 15 years before being bought by the South West Regional Development Agency in 2001. A total of 29 buildings on the 31-acre site have already been cleared, and work has now started to demolish the derelict Hepworth building, and an on-site chapel. Proposals recently submitted for the site include a combined emergency services control centre, offices, shops and cafes. A more detailed planning application is expected by the end of this year. Two 19th Century buildings on the site received listed status in August.